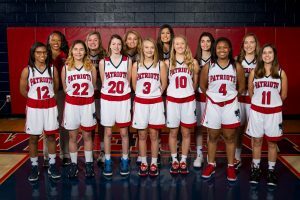 Calling All Patriot Fans – Powdersville Girls Basketball plays Pendleton at Liberty High School Thursday, February 7. at 6pm. Winner will earn a home court advantage for the first round of playoffs on Monday, February 11. The two teams finished regular season tied for second place. Powdersville won by four points at Pendleton, and Pendleton won at Powdersville by four points in overtime. Expecting another exciting game! Make the short road trip to Liberty and cheer loud for our Lady Patriots!! #MakingHistoryEverySeason! #GoPatriots! !